When will it land on Mars? For us Earthlings, the Curiosity rover will land on Mars at 05:31 UTC on Aug. 6 (10:31 p.m. PDT on Aug. 5, 1:31 a.m. EDT Aug. 6) plus or minus a minute. This is Earth-received time, which includes one-way light time (13.8 minutes) for radio signal to reach Earth from Mars. The landing will be at about 3 p.m. local time at the Mars landing site. How long does it take for the rover to get to Mars’ surface after it reaches the outer atmosphere? About 7 minutes. Dubbed the “seven minutes of terror” by NASA, MSL will employ a parachute, landing rockets, a hovering sky crane, and other complicated mechanisms to help lower the rover to the surface of Mars. How big is the parachute? How big are the spacecraft and the rover? 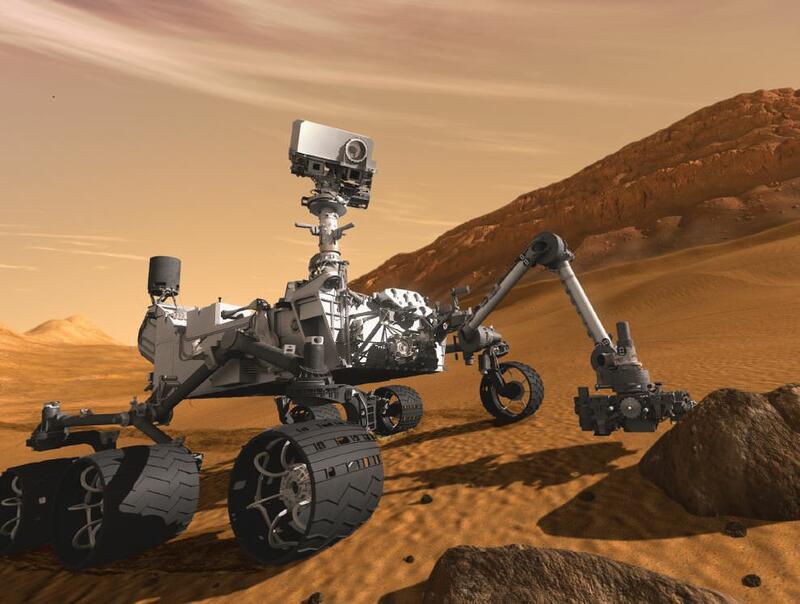 Curiosity Rover dimensions: Length: 3 meters (9 feet, 10 inches) — (not counting arm); width: 2.8 meters (9 feet, 1 inch). Arm length: 2.1 meters (7 feet). The arm is capable of collecting powdered samples from rocks, scooping soil, preparing and delivering samples for analytic instruments, and brushing surfaces on the planet. Mass: 3,893 kilograms (8,463 pounds) total at launch, consisting of 899-kilogram (1,982-pound) rover; 2,401-kilogram (5,293-pound) entry, descent and landing system (aeroshell plus fueled descent stage); and 539-kilogram (1,188-pound) fueled cruise stage. How does the rover get its power for roving? What are the science instruments on board Curiosity? How many cameras are on Curiosity? Nov. 26, 2011, 10:02 a.m. EST, from Launch Complex 41, Cape Canaveral Air Force Station, Fla.
How far is Mars away from Earth? How fast can Curiosity rove? On average, the rover is expected to travel across the surface of Mars at about 30 meters (98 feet) per hour, based on power levels, slippage, steepness of the terrain, visibility, and other variables. Where is Curiosity’s landing site? Landing site: 4.6 degrees south latitude, 137.4 degrees east longitude, near base of Mount Sharp inside Gale Crater, a layered mountain that rises 4.8 kilometers (3 miles). The mountain was named after planetary geologist Bob Sharp. What will the weather be like at Gale Crater? Expected near-surface atmospheric temperatures at landing site during primary mission: minus 90 C to zero C (minus 130 F to 32 F ). Basically, cold and windy with wind gusts of up to 144 km/h (90 mph) —as strong as some hurricane winds on Earth. Mars is home to dust storms and quickly moving whirlwinds known as dust devils. 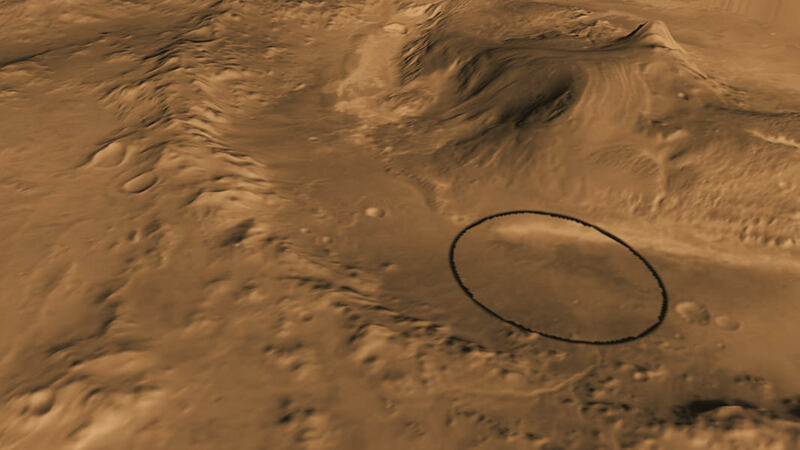 How many possible landing sites did scientists considered before deciding on Gale Crater? 60. Gale Crater was chosen because it is thought to contain elements that are important to the search for the ingredients of life. How long is the primary mission? One Martian year. Because a day on Mars is longer than one on Earth—39 minutes and 35.244 seconds longer, to be exact—a Martian year is equal to 98 weeks, or 687 days, on Earth. How much does this mission cost? $2.5 billion, including $1.8 billion for spacecraft development and science investigations and addition amounts for launch and operations. Since Curiousity is powered by an RTG instead of solar panels, what are the chances of an extended mission? Put another way, is the RTG calibrated for a hard stop at 98 weeks, or is that more of an admin type deadline that could be extended, such as Opportunity, Spirit, Cassini, and many others. iirc the RTG has enough juice to provide the rover with power for over a decade. I would imagine that the mission will be extended past the projected deadline. It would be a waste to abandon a perfectly good $1.8billion rover on the surface of mars. Especially since NASA wont be sending another for quite some time. Hopefully they got resolved though. “More Recent Concerns. Project managers stated that the expected performance of the rover’s power generation system, the Multi-Mission Radioisotope Thermoelectric Generator (MMRTG), has been reduced. Thermoelectric modules inside the MMRTG, which was developed and provided to NASA by the Department of Energy, convert heat (thermal energy) from the decay of a radioisotope (plutonium-238 dioxide) into electricity. Project managers attribute some of the MMRTG’s performance degradation to the natural radioactive decay that occurred during the 2-year launch delay. However, unexpected temporary reductions in the system’s power output were also noted during testing that simulated the vibration and shock that MSL will experience during its entry, descent, and landing on Mars. The RTG survived the launch, or MSL would be without power. Still that landing and the nominal 1 year to survive. Anything after that will be a bonus indeed. Thank you all for those informative answers. Everything you folks wrote reinforces the idea that nothing about this mission is either simple or routine. Aside from the science that will be done, this mission has a huge cool factor. First, the nature of the descent is impressive. The vehicle is going to execute a very complex and precise series of acts, all without realtime human intervention. Hats off to the engineers who are and did make it happen. Then, there will be a nuclear powered, autonomous (largely) automobile operating on another planet; not to mention that it also a state of the art laboratory with everything except white coats walking around it. This is another event for which all of humanity can be proud. To the Curiousity design, launch, flight, and mission teams: thank you. is the rover going to make revolutions around mars in orbit before descent or is it a one shot deal? Previous PostPrevious Curious About Curiosity’s Chemistry Mission?